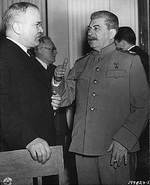 ww2dbaseHaving difficulty in persuading Joseph Stalin to depart from the Soviet Union, Franklin Roosevelt and Winston Churchill, the latter with much reluctance, agreed to meet the Soviet leader in Yalta in Russia (now Ukraine). A pre-war spa town, Yalta was no longer its once glorious self, having barely survived looting as German troops evacuated not too long ago. To prepare the city for the conference, cleaning crews and hospitality personnel arrived from various cities, while furnishings were brought in by the truck load; making a rare exception, Stalin allowed US Army troops to precede the US President to fumigate various locations in Yalta in an attempt to rid of potential diseases. ww2dbaseThe conference, codenamed Argonaut, began on 4 Feb 1945. In terms of European affairs, Stalin insisted on the dismantling of Germany after the war, which Roosevelt and Churchill agreed with, though only in the form of a temporary occupation rather than a permanent dismemberment of the country. On the situation in Asia, Roosevelt pressed on Stalin to maintain Stalin's earlier promise that the Soviet Union would declare war on Japan three months after the fall of Germany, but in exchange, Stalin demanded the southern half of Sakhalin island, the Kurile Islands, and territories in Japanese-occupied northeastern China. Poland was also among the hotly-debated issue, with the Western Allies wanting to install the government-in-exile currently in London, while the Soviet Union preferred the Lublin-based Soviet-sponsored government. Finally, the two sides also argued over whether Soviet puppet states such as Byelorussia and Ukraine would have votes in what was to become the United Nations once it was established. ww2dbaseAs the United States slowly transformed into the dominant western power, displacing the United Kingdom, Roosevelt conducted most of the political maneuvers on behalf of the Western Allies, while Churchill was relegated to the role of a spectator in some of the conversations. The declaration of liberated Europe, allowing for democratic elections in all the liberated territories (Note in reality democratic elections never took place in postwar Soviet-controlled Eastern Europe). A conference in April in San Francisco on the proposed world organization, the United Nations. The structure of the UN was also considered and the Security Council idea was agreed upon. The U.S. and Britain also agreed to support the Ukrainian and Byelorussian Soviet Socialist Republics having separate UN seats. A UN territorial trusteeship would also be applied to existing mandates of the League of Nations and territories detached from the enemy as a result of the war. The dismemberment, disarmament and demilitarization of Germany, which the three powers saw as "requisite for future peace and security". The country was to be divided into zones amongst the Allies, with large sections of Eastern Germany annexed by Poland and Russia. The 15 million Germans in these areas were to be expelled. The French were also granted a zone of occupation and membership of the Allied Control Council for Germany. Reparations from Germany for "losses caused by her to the Allied nations in the course of the war". Reparations were allowed in the form of the removal of national wealth (machine tools, ships, shares in German enterprises, etc. ), the annual delivery of goods for a period to be fixed, or the use of German labour. The Americans and Russians agreed on the figure of $22 billion in reparations, while the British delegation did not believe a final figure could yet be arrived at. Poland was to have a "broad democratic provisional government" leading up to "free and unfettered elections as soon as possible on the basis of universal suffrage and secret ballot" (Again, in reality, Poland became tightly controlled by the Soviets and elections were nowhere near "democratic"). In Yugoslavia the Tito-Šubašić Agreement would be put into effect, merging the Royal and Communist governments. The Soviets agreed to intervene in the war with Japan within three months of the German surrender. In return they would be given the Sakhalin and Kurile Islands and pre-eminent interests over Port Arthur and Darien and its rail connections (Note that these agreements were made without the presence or consent of Chiang Kaishek). 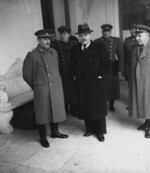 Concerns over the Italo-Yugoslav and Italo-Austrian frontiers were postponed as were decisions over Yugoslav-Bulgarian relations, Romania, Iran, and the Montreux Convention. All captured Soviet nationals be repatriated whether they were willing or not. 4 Feb 1945 The Yalta Conference commenced in Russia. 8 Feb 1945 Joseph Stalin held a feast for the Allied leaders at Yalta, Russia. 11 Feb 1945 The Yalta Agreement was signed by Roosevelt, Churchill, and Stalin, with Stalin pledging to declare war on Japan three months after the German surrender. 12 Feb 1945 The Yalta Agreement was publicly announced nearly simultaneously in Moscow, Russia and London, England, United Kingdom regarding the handling of Germany after the war. Thanks for visiting WW2DB Bryce. We'd very much appreciate the link, thanks!